To announce that I love dogs would be stating the obvious, so let me begin by saying that my love of dogs doesn’t discriminate. While I’m often wary of people, there isn’t a dog I won’t approach for cuddles and kisses. So when I heard that my friends Rebecca and Josh adopted a three-year-old pit bull from Hug A Bull rescue, I couldn’t wait to meet him. This past weekend I got my chance. What surprised me most about Jake first was his size. He isn’t the beastly, muscular menace most come to expect with pit bulls. Jake is a 50-pound pure-bred American Staffordshire terrier that was built for play. He instantly took to me and was quick to show off. 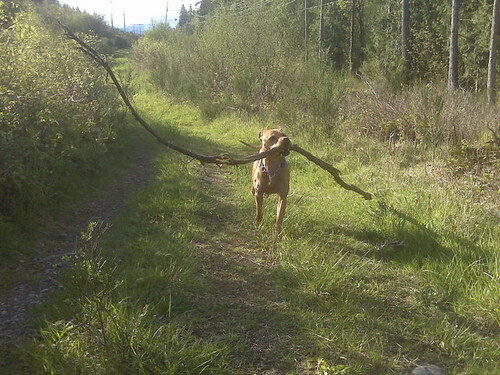 Rebecca and I took Jake for a walk in the woods where he displayed his expertly perfected stick-fetching skills, all the while being entirely cute. Yes, cute. His mannerisms and facial expressions were almost puppy-like and it was impossible not to fall for Jake’s charms and huge heart. When the walk was done and Jake had expended all his energy in the woods, he climbed up on the couch beside me, flopped onto my lap and rested his head on my knee. The boy loves to cuddle when not showering his “mommy” with appreciative kisses. The stigmas attached to this breed of dog have become unavoidable, but I can’t help but wonder if such stigmas would exist if not for the media. Fear sells headlines, so it’s not unusual for news outlets to resort to fear mongering. No doubt a pit bull’s bite would be stronger than that of, say, a golden retriever. However, if a golden retriever barked at and nipped someone at the local park, it’s highly unlikely that the story would make the 6 o’clock news. My personal experiences with pit bulls have only ever been positive ones. One of my closest friends is a Special Constable with the BC-SPCA and, over her career, has only ever encountered a single aggressive pit bull. Breaking through stigmas surrounding animals is, in my opinion, equally important as breaking through the stigmas we have regarding people. That said, what have been your experiences with this breed? Do you love them? Fear them? Why or why not? I personally really like them… But, …. We take our dog to dog parks quite often and the one we’ve been going to has frequent pit bull visitors, there definitely have been issues… The thing I’ve noticed though, is that lots of times it also has to do with the owner… I don’t necessarily think, it’s the dog that’s “evil”. 2 pit bulls were playing with each other, pretty roughly (If it was my dog, I probably would have given him a time out). But the owners were both fine with it. At a certain point another dog owner told the guys to take the dogs apart because they were playing to aggressively. The pit bull owners started swearing at the other owner (with kids around). So basically what I’m trying to say is, if the dogs nature is to play/act like that, and nobody bothers to tell him that maybe that’s not appropriate, how can you expect the dog to behave properly if know one taught him how…? I tend to agree… I often see one or two pit bulls in and around the dog parks I take Jordy to. The ones that aren’t behaving in a way that’s socially acceptable are usually not being well controlled by their owner(s). I believe that 99% of a dog’s behavior is dependent on what its owner(s) encourages or discourages. Dogs are pack animals by nature. A pit bill with an owner that displays consistent, firm and loving leadership will be a dog with a consistent, firm and loving disposition. You are so right. The stigma attached to pit bulls is completely media driven. A couple of my friends own pit bulls and they are the sweetest dogs. To quote a bumper sticker; “punish the deed, not the breed” LOVE the picture w/ the huge stick, totally made me smile! How great to see Jake making headlines!!! All positive ones at that! As someone who has met and spent time with Jake, you’re right, he’s nothing but love, as are the majority of this breed. While we can’t say for sure, Jake is more likely a purebred American Pit Bull Terrier, due to his small, compact size. Essentially the same breed as the American Staffordshire Terrier, just conformationally bred differently over the years. As a professional dog trainer/behavourist and someone who works within HugABull I am always advising owners that pit bulls are not meant to be in the dog parks. For the most part, pit bulls much prefer the company of their people rather strange dogs. They also play extremely hard, very rough and tumble, which many dogs have a hard time tolerating. Pit bull owners should stick with dogs they know and in areas that won’t happen upon strange dogs. Anyway, we’re so happy for Jake, and are thrilled that he found the perfect forever home! That boy sure deserves it! I own an American Pit Bull Terrier, and I would never EVER take her to a dog park. Mostly because of the kind of owners you have described. My dog does play rough (much like a boxer or other “bull breeds”), and I know that not all dogs would appreciate or tolerate her play style. Because of that, she gets to meet up with dogs she knows, who have responsible owners. This way she is socialized in a safe manner, and still gets to have fun! I love all dogs, no matter what the breed! I admit, however, I’m definitely nervous around Pit Bulls because of their ‘reputation’. It is good to hear that there are responsible owners out there (like Kayte!) who understand the temperament of the breed and take precautions so that their dog is happy, no one/dog is harmed and everyone gets along. When I was married – my husband at the time had a brindle pitbull named Hamlet. He was hit by a car, but before that I had the chance to get to know him. Cuddliest lap dog ever. Kind, sweet & gentle. He was very intuitive like most dogs are, but he was such a gem. Great comments…up to us as dog owners to bring them up properly. That picture is so funny! My sister and her husband have a beautiful staffordshire terrier cross – named Keira actually (the Humane Society named her! But I couldn’t imagine a sweeter dog to share a name with). People tend to eye her up a lot because of her size and the stigmas attached to her breeding but she is a sweet, loyal dog and one of the friendliest I’ve come across. She just has the brightest, happiest and loving eyes I’ve ever seen. She definitely can play rough but can also turn it off instantly. I totally agree with a dogs behaviour being a complete reflection of the owner’s behaviour/responsibility. There are definitely some breeds that play rougher than others but I’ve seen more poorly behaved poodles and shitzus than pitbulls and staffordshire terriers. Just sayin’. When I walk my English Bulldog (on a leash) people will still cross the street to get away from him. Bull breeds do have the worst reputation and it is totally undeserved. I agree 100% about the owners, they do play rougher than most and you do need to make sure the other dogs are OK with the play being rough. My dog has many best friends ranging from St Bernard to Pug to tea cup chiuaua. Introduced in the correct way and supervised I believe my “mean breed” dog is one of the friendliest and best puppies out there! I do believe whole heartedly that Pit Bulls have been over dramatized in the media, they are not the monsters they are portrayed. Any dog can be agressive if not properly taken care of. Just ask the poor pit bull that had his leg broken and nearly lost his eye to a neglected Jack Russell Terrier over here in langley. I own two dogs, one is a Shih Tzu the other being a Pit Bull. My two dogs can play together quite fine, and its usually the Shih Tzu that I have to tell to play gentle, the Pit Bull if she has had enough will just flop onto the furry little squeaker. Are they ever left unsupervised? Nope cause accidents can happen, that is why both are crate trained, and in their kennels when nobody is there to watch over them. I would never leave two dogs alone, regardless of the breed that is just an accident waiting to happen, even dogs that have been friends for years could end up having a tiff. Saying Pit-Bulls are any more dangerous than all the other breeds out there is just proving how ignorant people can be. So far I have yet to meet a Pit Bull I didn’t like. Im a firm believe in punishing the deed not the breed.